Our household has a bit of a children’s coat obsession. As far as expensive habits go it’s not an impractical one, given the frequency of usage. After all, when you have to wear a piece of clothing EVERY DAY for three-quarters of the year, it would be a shame for it to be exactly the same design every day. The twins have Cololo duffles for when it’s really cold and matching duck raincoats for light Spring showers, but when House of Fraser got in touch to offer them some treats from their current range I couldn’t resist choosing another couple of coats – this time, Toby Tiger sausage dog and dinosaur raincoats. We are big fans of House of Fraser for children’s clothing, particularly their online store as they have such an extensive range. 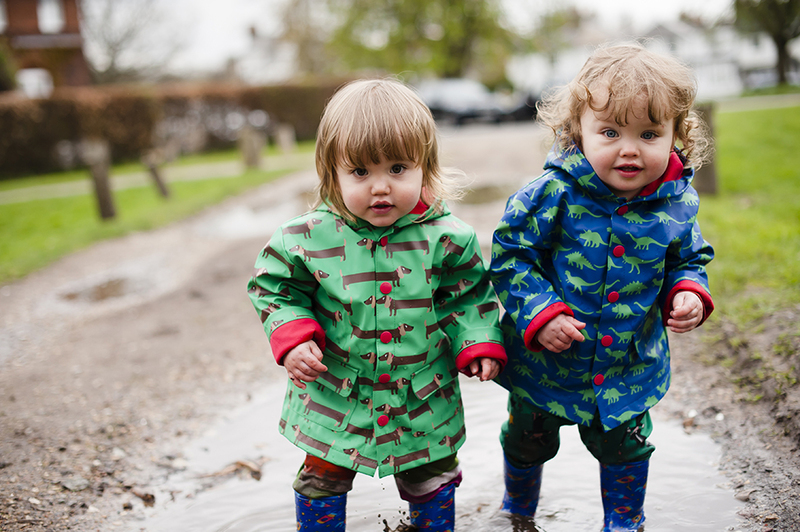 We can find many of our favourite brands there, not only Toby Tiger but also Frugi, Kite and Polarn o. Pyret. Parents who like to dress their children in bright, fun clothes are thoroughly spoilt for choice. In fact, I think that I could easily kit the twins out for an entire season of clothing just at House of Fraser if I wanted to save myself some shopping time. 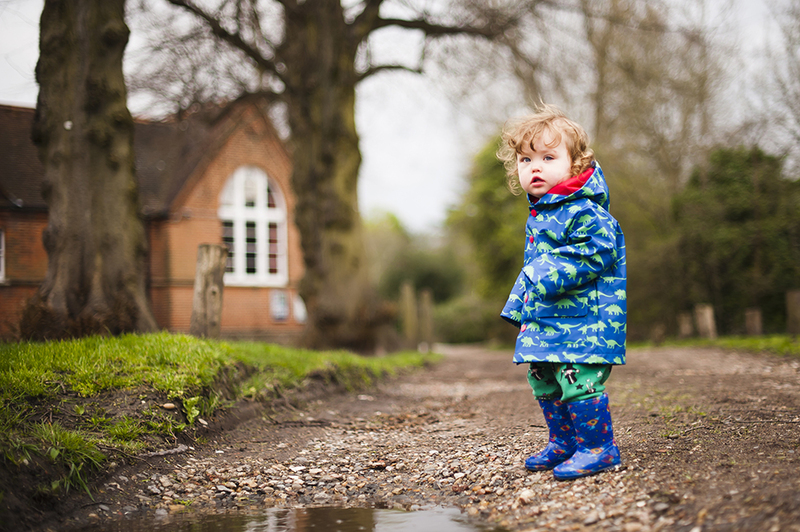 Last weekend we tested out our raincoats with a splash in some puddles local to our house, inadvertantly meeting another milestone that I hadn’t wanted to miss. 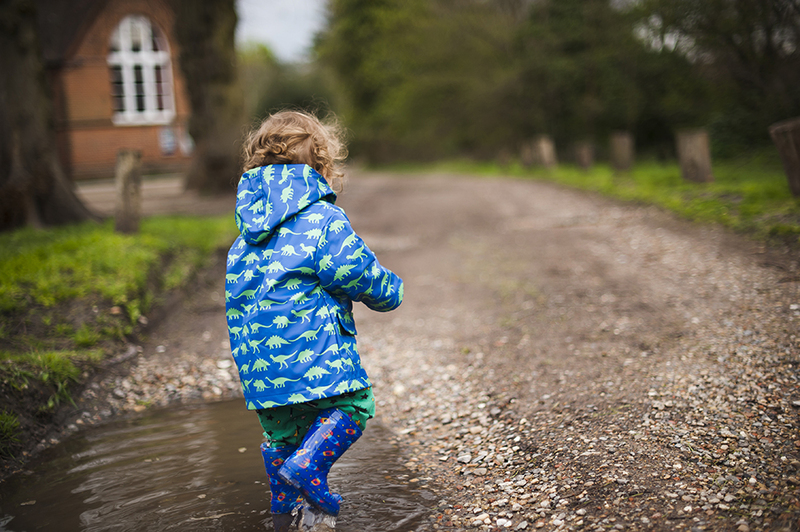 The twins got their first set of wellie boots recently and until then we had been reluctant to set them down outside unless it were quite dry, but with waterproof shoes and coats plus the weather being a bit warmer they can splash about to their heart’s content! 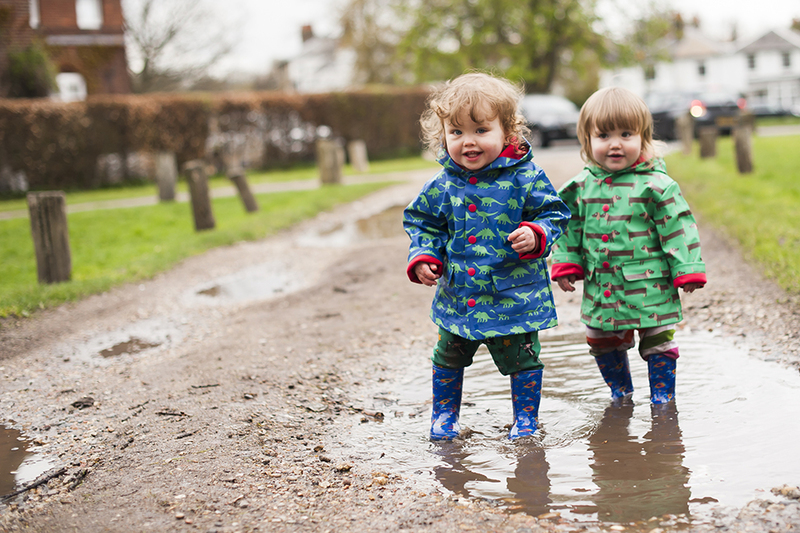 Typically, both of them tripped over and landed face first in the biggest puddles they could find but there were no tears and they didn’t seem too traumatised by the cold, wet 25-minute walk home. Spending time with my toddlers is such fun at the moment. Of course it’s bittersweet that I only have them at the weekends, as a full-time working parent, but every Saturday they surprise me with something new. They both have obsessions with noses at the moment and love to point them out, mine, each other’s and their own, and Lysander, who doesn’t tend to be so verbal as Balthazar, actually has a much better pronunciation of the word ‘nose’ – it’s so funny to hear a real word in his sweet little voice! They are becoming such little people. They have this adorable game of sorts where they come into bed with me and tuck themselves up under the duvet with their head on my pillow, again, like people as opposed to babies. I suppose that I can’t call them ‘babies’ really any more when they turned eighteen months old yesterday, but it’s all gone by so quickly that I haven’t mentally adjusted to them being toddlers yet. I just love being their mother. I really do, even though it’s hard sometimes and I feel like I’m being stretched paper-thin an awful lot of the time. It’s all worth it. 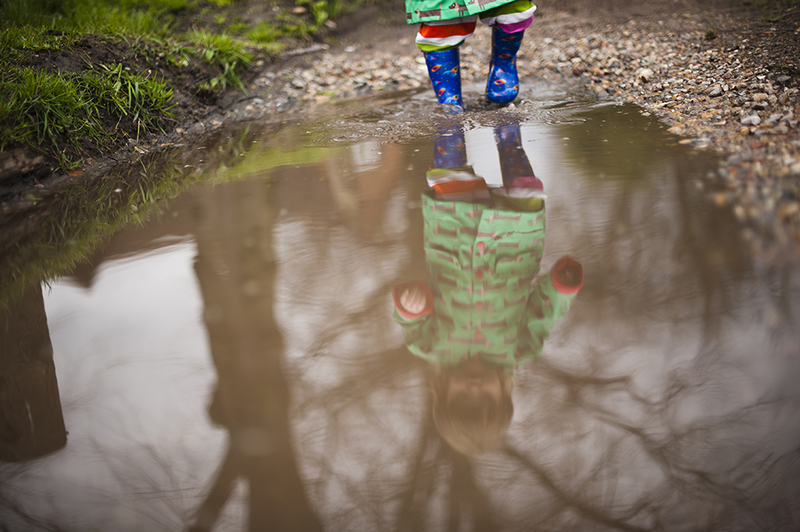 Moments like this, splashing in the puddles with my children, just remind me of how incredibly fortunate I am. 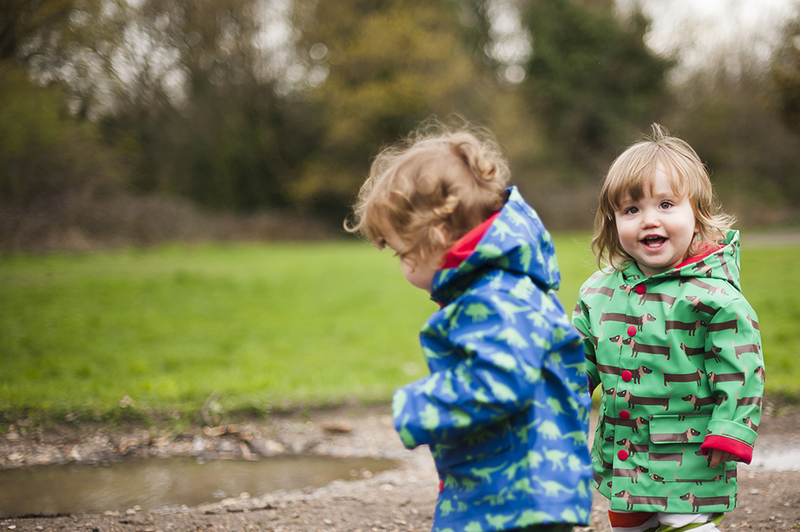 Big thanks to House of Fraser for sending us these beautiful coats in exchange for an honest review. Gosh they are adorable raincoats! 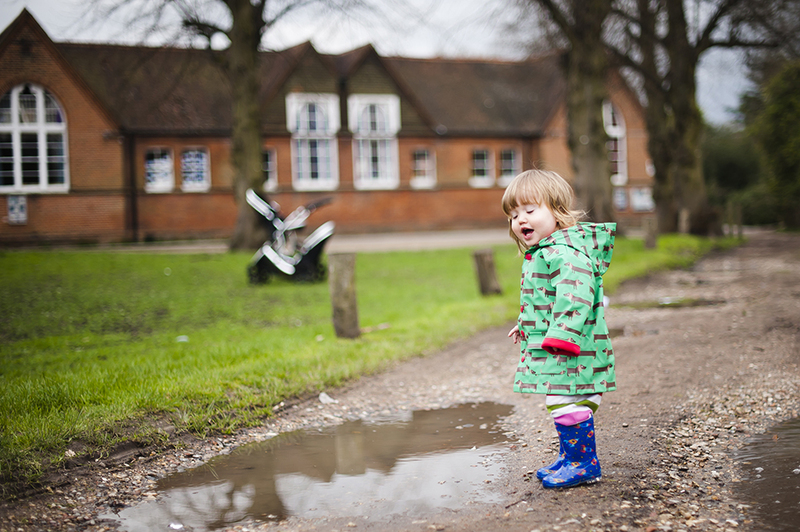 I loved the first time I saw M jumping in puddles. He has never been a huge fan of getting wet and dirty but last year he decided it was super fun and ramped it up a gear. 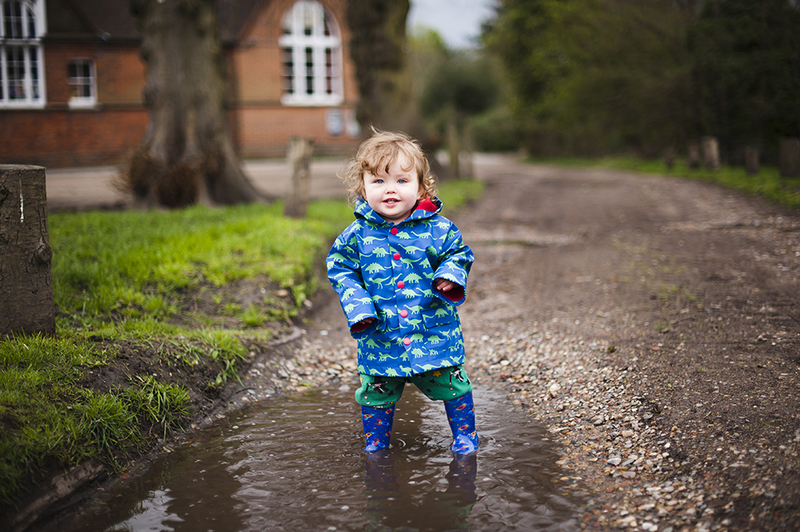 Now he actively seeks out the biggest puddles.